Please refer to the previous articles in the Pula Imvula magazine written, covering the basics of keeping long term rainfall records in November 2016 and 101 years of rainfall records – a valuable resource for crop production published in February 2017. If you are new to farming it is essential to start keeping daily rainfall records usually measured as the millimetres (mm’s) of rain in the rain meter at 8h00 in the morning every morning if possible. If the water in the rain gauge is iced or contains hail stones these should be allowed to melt to be able to obtain an accurate reading. The rainfall recorded reflects the rainfall received in the previous 24 hours. You can either download an example from the internet, compile your own sheets on excel, keep your own handwritten book or join up with the South African Weather Service (SAWS). This department is part of the Department of Environmental affairs. It would be to your advantage to submit your rainfall records, usually to the airport nearest you or closest Agricultural Department. You receive an official book and it will stimulate you to nurture the discipline to keep records year in and year out. Phone SAWS on 012 367 6000 to find out how to register, receive your record keeping book and where to submit your monthly rainfall records. If you have recently purchased, rented a farm or have access to farmland through a government scheme it is advisable to ask previous land owners or users for any available rainfall data that might have been accumulated over the years. Otherwise contact SAWS to obtain the records in the designated rainfall district in which you are farming. Neighbours with detailed rainfall records can also be asked for the information. There are many micro environments within an official rainfall district and on farms depending on local mountainous regions creating areas of high and low rainfall on individual lands or areas of larger farms. Several rain gauges should be placed at these different areas so that accurate records can be kept over the long term. The differences can be noted. The gross margin planning can thus be tailormade for the soil potential, rainfall and temperature to ensure the yield targets for crops, pastures and orchards are matched to what is possible under the prevailing agricultural conditions. It is extremely important to have high management and input of direct production resources to where the most gain can be achieved. You can make your own weather stations at the points where the rainfall and temperature is recorded. A proper protected and lockable box on a pole at convenient height will facilitate easy record keeping. A high/low temperature gauge can be purchased and should also be placed in the shade at a place where it does not receive direct sunlight. The temperatures thus recorded can be used to work out the heat units received every month, especially for the different micro environments, in lands used for cropping. A heat unit is defined as the maximum daily temperature minus the minimum daily temperature minus a crop correction factor to give you the heat units for that day. These are then added up for the growth cycle of a seasonal crop and calibrated with the cultivars chosen. This is critical in choosing the correct cultivars and optimum planting dates to achieve the best yield possible. See previous Pula Imvula articles for more detailed discussions regarding crop heat units. 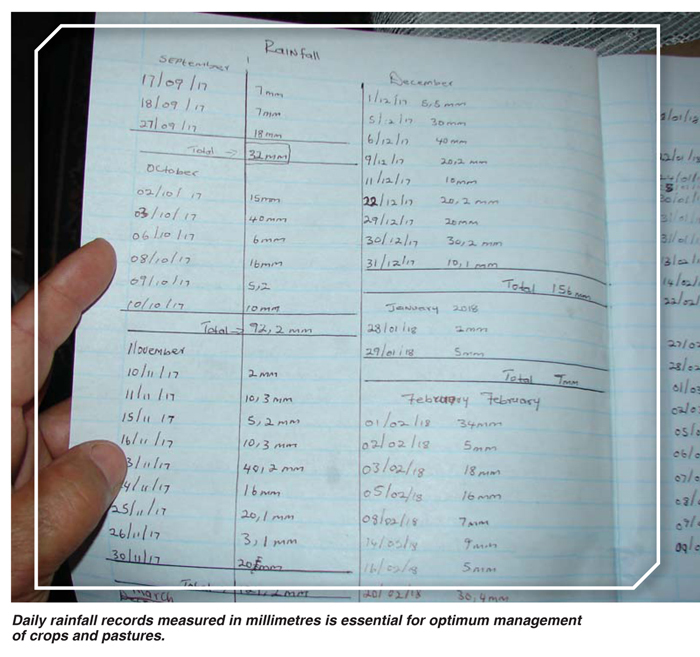 Use your long term actual monthly rainfall and temperature records for optimum management of crops and pastures to achieve financial success.